Our 2nd annual Ramadan Celebration was held on Friday, May 11th, 2018. The main purpose of this event was to create awareness about Ramadan and clear out any misunderstandings about Islam and Ramadan itself. As Muslims we always get asked about why we fast, why Muslim girls wear hijab, and what Ramadan is. We thought that holding an event like this will benefit people not only at an individual level but also as a community. We had an information table about Ramadan, a try on Hijab table and free food. And we would like to give a special thanks to the many shops and organizations that contributed to this event, thank you to Zabiha Foods, Lahori Restaurant, ICNA Vancouver, Lovely Sweets and Al Ameen Post for your generosity. With the help of PM community leadership’s class and the efforts of many students this event wouldn’t have been successful with the way it was. 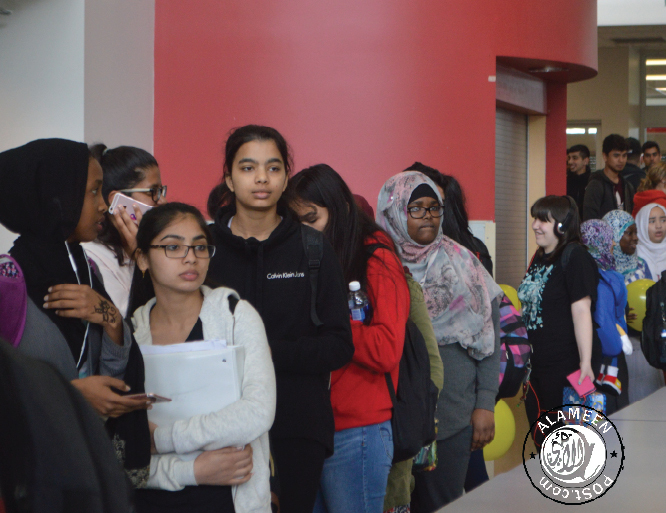 We spent months preparing for this event by fundraising at lunch, taking out time to making announcements, posters and inviting the school community to join us. As a team, we would like to recognize our photographer, Akash Ranu, for stepping up to take pictures. Our teacher sponsors, Mr. Dengler and Ms. Hogg, supported us till the end, without the help of these teachers this event wouldn’t have happened. Thank you for everyone’s support and Insha’Allah we hope to do many more events like these in the future.